There are many reasons someone buys a game. 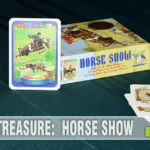 They hear it is fun from a friend (or an awesome website), they may have previously enjoyed another game that uses a similar mechanic or maybe they just love the theme. 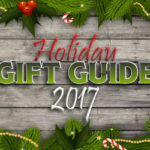 With the coming of the new year, we took a little time to look back at some of the themes that have been prevalent in board games as of late. Zombie games have been around for quite a while and pirate-themed titles are well-represented in our game collection. There is no shortage of games set in fantasy worlds with orcs and ogres and with the genre recently entering the public domain, the past year or two has seen a number of Lovecraft/Cthulhu games hitting the market. But when I look at very recently published games (or ones slated for early 2018 release), I see a new theme coming to the forefront – witches and the occult. This isn’t a new thing to the game industry. 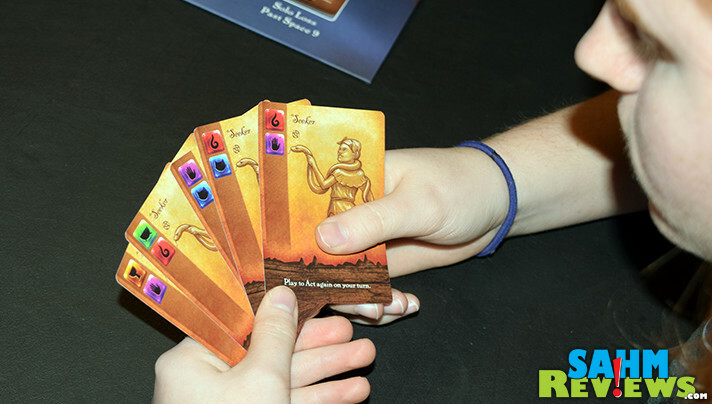 There have been scores of games with a witchcraft theme. Many of them are playfully based around the subject of Halloween or keep things light with cartoon caricatures and friendly play. This genre is finally getting the dark treatment it deserves, so we thought it would be fun to start off 2018 by highlighting quite a few newer games that employ witches as their central themes. Did you know that during our country’s war for independence there were more than just the armies, militias, Indians, Redcoats, loyalists, slaves, patriots and the French involved? Our side would not have won without the help of witches determined to gain freedom from tyranny. Covens all over the eastern coast worked to conjure powerful fighters and overcome potentially devastating events in their efforts to help obtain American independence. Well, that’s the premise of our first witch-themed game, Witches of the Revolution by Atlas Games! 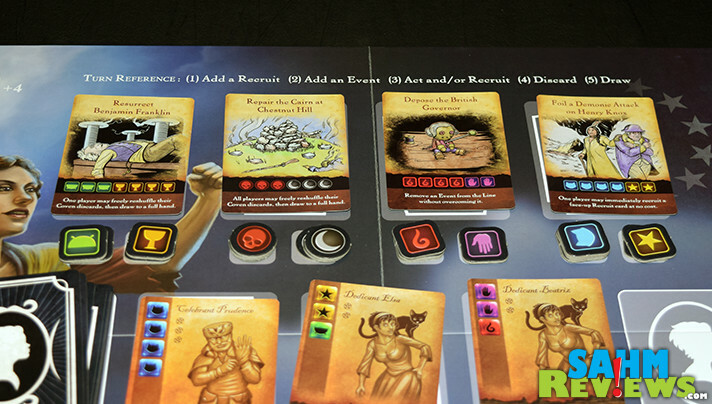 Witches of the Revolution is a cooperative deck-building game set in the 18th century. 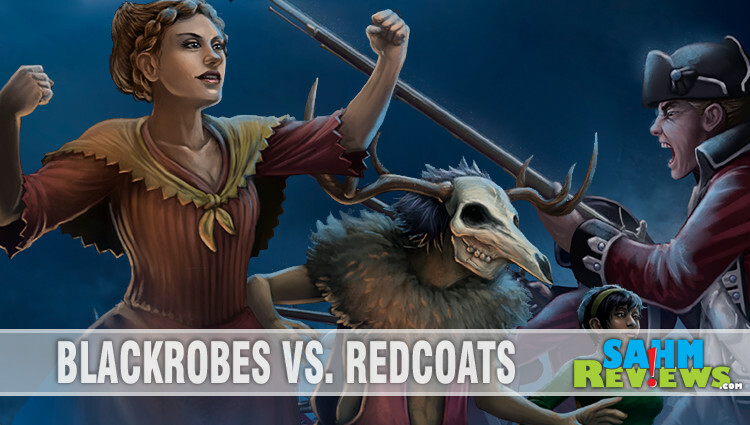 You and up to three other players are the leaders of individual covens with a common goal – to help the American revolution succeed. Only by cooperating with the other covens can you successfully prevent random events from occurring and summon great beings to aid in the country’s fight. Each coven begins with a custom-illustrated deck of 15 Seeker cards, each with a different number of colored icons in the upper left corner. The rest of the Recruit cards are shuffled and mixed with six Blessing cards according to the instructions. 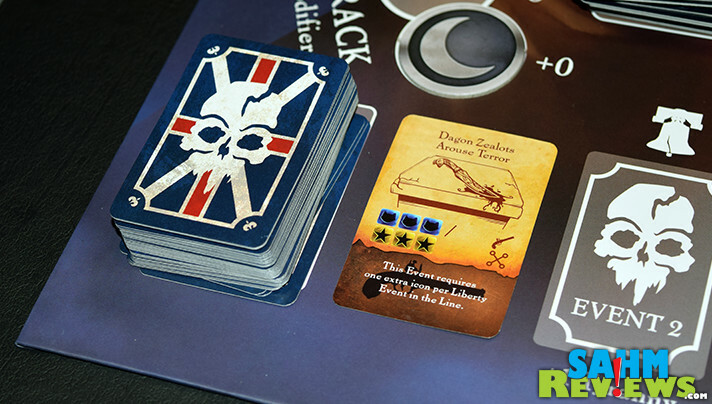 Four randomly-selected Objective cards are drawn and are the only ones used for the game. The rest are returned to the box. Although there are 80 included Event cards, only 40 are used in any game. Half of the cards are regular difficulty, with the other half considered advanced. Your group can dictate how difficult the game will be to win based on the number of randomly-chosen advanced cards. This deck is shuffled and placed face-down in the space marked “Event Draw Pile”. Each player’s turn is resolved in the same manner, following the five possible phases. First you add a new Recruit to the pool, moving any existing Recruits to the right. If the pool is full, the Recruit on the right is discarded from the game. Each movement to the right makes that card cost just a little less, so sometimes you are trying to time your purchase until it is most effective. Next an Event card is drawn and added to the event line. These represent things happening in the world and must be overcome as quickly as possible. If an event card ever reaches the space marked with the number of people playing, everyone loses. There are also some spots on the Event track marked with a Liberty Bell or a pistol (Peril). If an Event card has a matching icon and reaches that spot, it triggers a movement towards Tyranny or forces the banishment of one of the available Recruits from the game. After these two cards (Event and Recruit) are revealed, it is now time to take the main part of your turn. You may either Recruit a new person to the top of your draw deck or act on an event in the Event track. Each Recruit has a cost listed, represented by stars. In order to purchase a new Recruit, you must discard cards from your hand with an equal number of stars. Those spent cards are removed from the game and your new recruit is added to the top of your draw pile. Keep in mind some Recruits will cost less than their listed price based upon their position in the Recruit row. Even if you don’t recruit, you may still choose to Act on an event. Each Event has a “price” listed in colored icons needed to overcome or prevent the event. Much in the same way as recruiting, you pay with Recruit cards displaying icons matching the required symbols on the Event card. You can choose which line on the Event card to pay as only one is required, not both. Because Event cards go into effect immediately, many will change rules or increase costs while in play. If you do not have enough icons to remove an event, other covens may pitch in with cards from their hands. However, each card submitted only counts as one of that color icon, no matter how many the card depicts. Plus, when their turn comes around they will now have fewer cards to utilize on their turn! When you successfully remove an Event card, you may collect a marker from one of the four Objectives that has an icon matching one on the Event card. Once all markers from an Objective have been claimed, that Objective is completed and you earn the bonus listed on the card. If your group is able to complete all four Objectives before running out of event cards, falling into Tyranny or an Event card reaching the last spot in line, you win Witches of the Revolution! In most deck-building games, you are trying to build a deck of cards that will work with each other to create powerful combinations. Witches of the Revolution does not go down this path. Instead, purchased cards replace lesser cards, making it more about upgrading your deck than making it larger. But every time any player has to reshuffle their deck to draw new cards, the marker on the moon track advances one space. 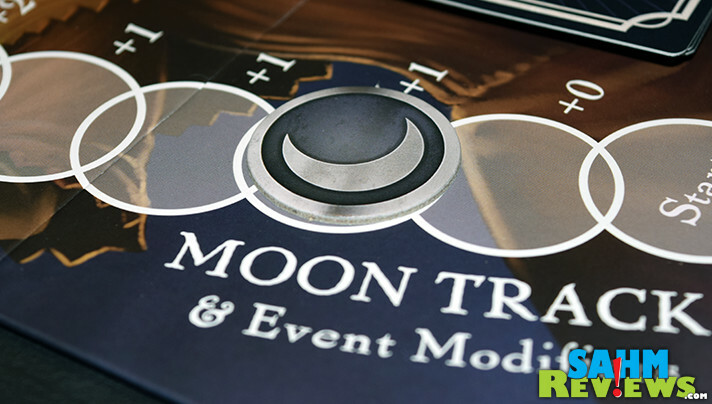 As the moon track moves higher, Event cards become more costly to satisfy. Fortunately once it reaches the end of the track, it cannot advance any further. So in Witches of the Revolution you actually want to try to build a larger hand, not a lean-and-mean one seen in most other deck-building games. 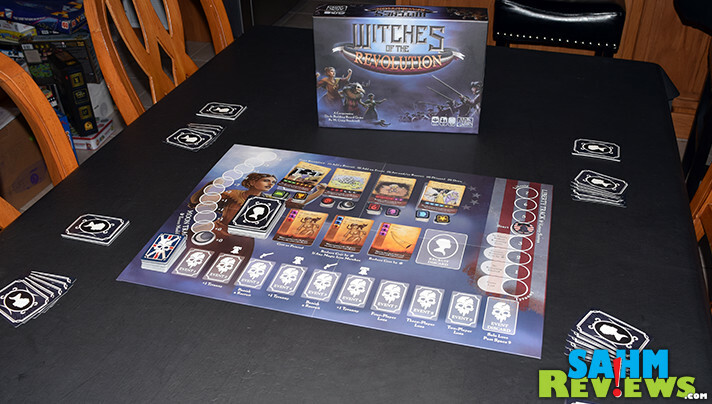 We’ll go out on a limb and say that Witches of the Revolution is one that has slipped under the radar of most boardgamers. At well under $40 shipped on Amazon, it provides a LOT more game play than many in this price range. 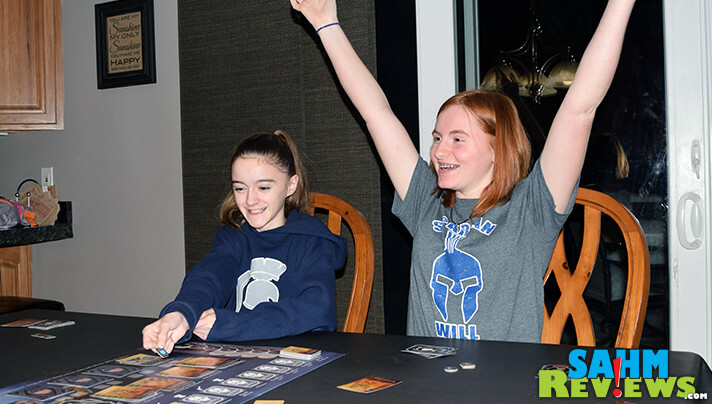 Thanks to the randomized Objective cards and the ability to customize the difficulty level, it is unlikely you’ll find yourself bored with the game any time soon. Even if you already have a deck-builder or two in your collection, you’ll want this one simply for the way it refreshes the genre. 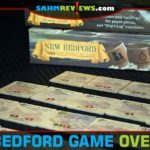 This is the first time we’ve featured a game by Atlas Games here on SahmReviews and judging from this first look, we’re excited to tell you about others in the future. Be sure you’re following them on Twitter and Facebook to find out more about their product lines and where you can see their games in person! 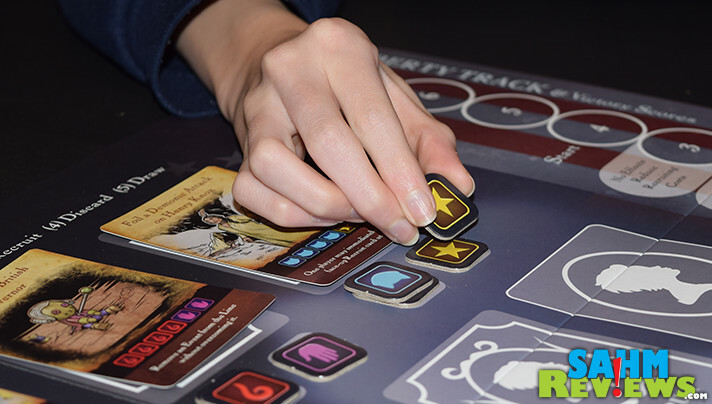 What is your current favorite deck-building game? Looks a lot of fun. I need to get to play with my nephews. I think my kids are still a little too young for this game. 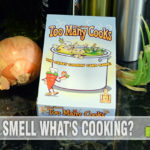 Looks like it might be a fun game to play along with some appetizers and some cold drinks. Wonder if it’s available in stores in Canada? I love cooperative games! This particular game looks so interesting and I bet my 14 year old daughter would like it. The historical aspect is pretty nifty. This is an interesting take on “war inspired” games. I appreciate the history nod thrown in. The only “battle” type of game I ever played was Risk. I hadn’t heard of this before, it sounds like it might be the type of game to play when time is not an issue. This sounds like so much fun! It would be a great addition to our game nights. 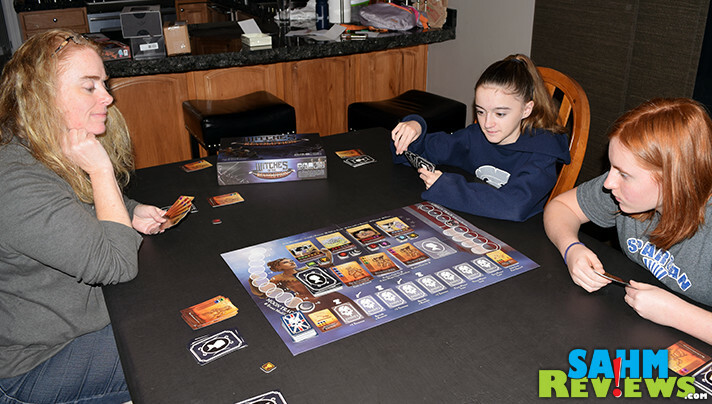 Deck building games are so awesome.